With all the emphasis on technical specifications and multiple varieties of surround sound, it's easy to lose sight of the simple truth that the basics still come first. As with traditional stereo, sound quality is the primary consideration. Allow a adequate budget to do justice to the multi-channel surround setup - there seems to be an intuitive expectation that multiple speakers, the amplifier channels to power them and the necessary surround processing should cost the same as regular stereo. This can only be achieved with a major cut in quality. 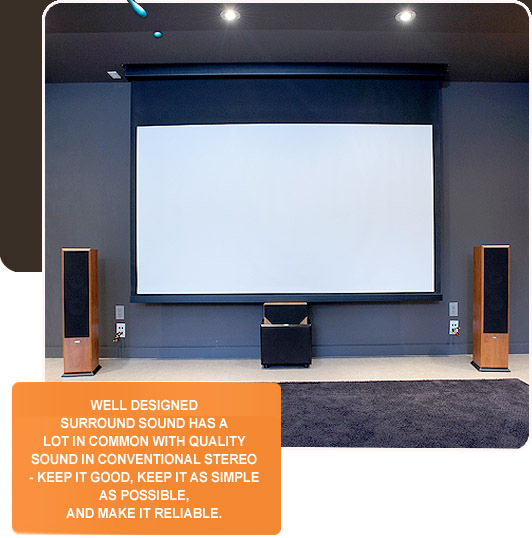 Well designed surround sound has a lot in common with quality sound in conventional stereo - keep it good, keep it as simple as possible, and make it reliable. Installation and adjustment are especially important in surround systems as the sheer complexity of the technology makes it more difficult to optimize. I will work with you to assess your needs, choose suitable components, and finish the installation to your satisfaction. Any questions you have from initial information through to enjoying your system will be answered by one person who is familiar with your particular situation.